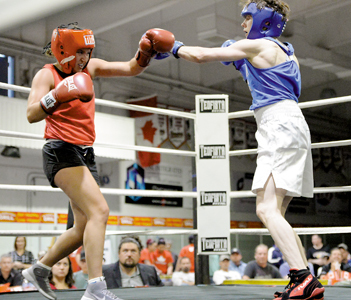 A half dozen locals put on the mitts and battled at the Teofista #31 amateur boxing card at the Taber Arena late last month. Headlining the card was Golden Gloves champ Brent Anderson who had a grudge match rematch against Emile Smith who he defeated earlier in the year. Anderson managed to gut out a split-decision victory in the 160-pound senior open division, despite feeling like he had to puke his guts out, having battled illness for days leading up to the fight on June 30. Smith was definitely in hostile territory as Taberites cheered on their hometown boy. Showing a little bit of showmanship, Emile egged on the crowd, with a playful turn as the heel, much to the dismay of the referee at times. For the actual fight, both fighters landed solid blows, resulting in a standing eight count for both fighters after getting tagged. Nevertheless, both fighters showed solid jaws in one of the more entertaining fights of the night where each fighter had their times where they were in trouble from barrages. Mills added the bout descended more into a street fight than Anderson would of liked, a bit of a by product of not feeling his best physically. Right prior to Anderson’s fight was Ryan Harkness earning an unanimous decision over Claye Oberkirsch. Harkness got the better of Oberkirsch with an almost Gumby-like knack for connecting on solid punches from unorthodox angles. Taberite Gavin Kinniburgh lost his junior ‘B’ novice 105-pound division fight to Kieren O’Neill. Kinniburgh looked to be the more technical fighter, but O’Neill overpowered him with his aggression, constantly cutting off the ring and throwing way more punches. Taber’s Abe Dyck lost an unanimous decision to Philip Motumbo in the 123-pound class for Senior Open. Dyck has consistently drawn tough opponents in his young boxing career where Mills sees his fight game more suited for the pros than for amateur. In an exhibition match, Taber’s Jen Davis battled Darby Havrelack for Senior Novice 160-pounds. “Jen fought really aggressively and those two just stood in the middle and beat on each other which was awesome,” said Mills. Among critic’s choice, the top fight of the night belonged to Taber’s Tiffany Olson who earned a unanimous decision over Jen Sweitzer for Senior Novice 115-pound class.